Everyone loves to have an opinion. 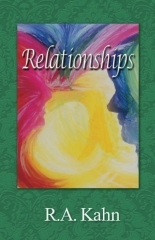 We've received some comments about the cover design of the book "Relationships", posted above. What are your thoughts? Can you see what the image is of? What does the picture mean to you? Please post a comment or email it. I'm intrigued at the comments that came in and wondered if others see the same.